Bass, Jefferson. The Bone Yard. New York: Harper Collins, 2011. I'll admit it: I like forensic fiction, especially any fiction that involves bones and nerdy scientists, etc. etc. It's hard to find clean, G-rated fiction in this particular genre, though. I have been pleasantly surprised with Jefferson Bass's novels, though. They are interesting and mysterious and full of all kinds of scientific information and historical information, but without any unnecessary violence or sexual scenes. 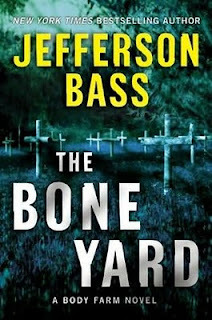 This particular novel follows Dr. Brockton as he travels to Florida to consult on the case of a skull that a dog brought home to its owner. This skull is soon followed by a second skull, then a femur. The case leads Dr. Brockton to the North Florida Boys' Reformatory, a juvenile detention center that burned down over forty years ago. I enjoyed following Dr. Brockton as he studied this case and discovered the answers. I was interested to discover that much of this story was based on a true case of a Florida boys' home where kids were, unfortunately, abused and mistreated. As we are rapidly approaching Child Abuse Awareness Month, I think this is an appropriate book for this time of year. If you like crime fiction or forensic stories or the TV show Bones, this book might just be for you. Grant, Amy. Mosaic: Pieces of My Life So Far. New York: Doubleday, 2007. I used to listen to Amy Grant's music when I was in junior high and high school. I remember when she came out with her first pop album and many people chose not to listen to her music any more because she had crossed over into the world of secular music. Soon after I began attending a university where her music was not acceptable, so I left my Amy Grant tapes (yes, cassette tapes - remember those?) behind with many others. I picked up her music again when I heard about her latest album, Somewhere Down the Road. The songs in this album were of great comfort and encouragement to me when I really needed it. I was intrigued, then, to discover that Amy Grant had written an autobiography of sorts. Mosaic is an apt title for this book. This is not Grant's life story in any particular order. She speaks of various memories and ties each of the memories or stories to a song lyric. 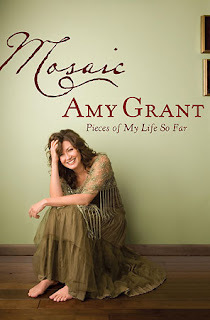 By reading the entire book, one can get a partial picture of Amy Grant's life, but not the whole picture. Still, it was interesting, and it was a quick and easy read. Definitely worth adding to my stack at the library. Blum, Jenna. Those Who Save Us. New York: Harcourt, 2004. Trudy is a professor of German history who has partnered with another professor in studying World War II. She is interviewing Germans who lived through the war, asking them about their role in the war and how much they knew about what was happening to the Jewish people. This particular project hits close to home, as Trudy's mother Anna had to make some tough decisions to ensure their survival during the war. This story sounded so interesting. I was really excited to start this book. 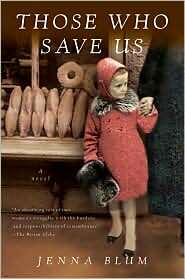 The chapters alternated between Trudy's story as she interviews the survivors of war and Anna's history in Germany as a baker's assistant and eventual mistress to a Nazi officer. Unfortunately, the chapters about Anna become quite graphic and explicit, to the point that I have chosen to put this book down. I do believe this story could have been told without all the graphic details and that nothing would have been lost by leaving those details out. I cannot in good conscience recommend that anyone read this book. Perhaps on my next visit to the library I shall find a reasonable alternative. 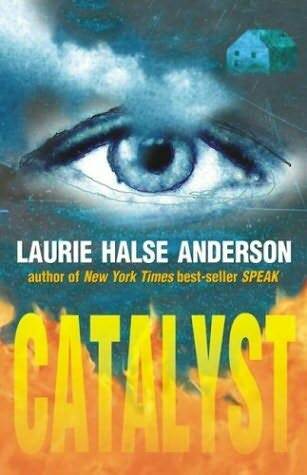 Anderson, Laurie. Catalyst. New York: Penguin Group, 2002. Laurie Anderson wrote one of my all-time favorite young adult novels, Speak. I was very excited to find Catalyst, another novel set in the same town and with some of the same characters as Speak. Kate is a straight-A student, a science whiz, an athiest, and a preacher's kid. She takes care of her house, her dad, and her brother while carefully managing her personal life as well. All of this falls apart when she finds out that she has not been accepted to MIT, the only school she applied to, and that her least-favorite classmate will be moving into her house and sharing her bedroom. Kate has to wrestle with a world spinning out of control and learns to be more compassionate to those whose lives are constantly spinning. I liked this story. I like Speak better, but this was a good story as well, and it was a quick read. It's definitely worth checking out of the library. Keyser, Elizabeth Lennox. 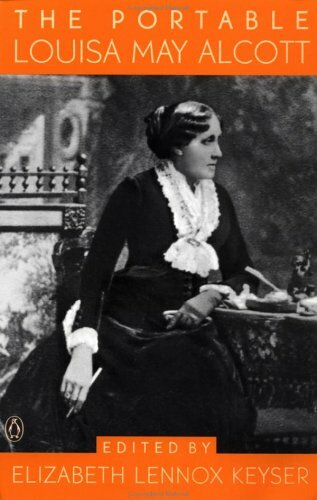 The Portable Louisa May Alcott. New York: Penguin Books, 2000. Recently I was able to visit Louisa May Alcott's home in Concord, MA. I really enjoyed touring her house and learning more about her life and the parallels between her story Little Women and her life story. While I was there, I couldn't resist purchasing one of her books, and I was happy to discover this anthology of her works. This book contains letters, essays, short stories, and snippets from Alcott's novels. I am quite used to knowing of Alcott as the author of Little Women; I did not know, though, that she also wrote short stories. I have thoroughly enjoyed exploring this other side of Alcott, and I highly recommend that you stop by your library for some exploring, too. Achebe, Chinua. 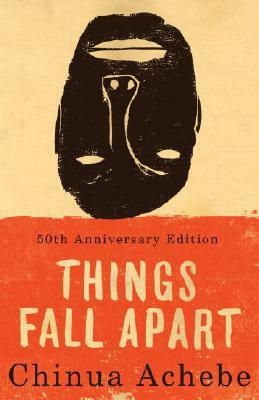 Things Fall Apart. New York: Random House, 1959. Things Fall Apart is a common entry on many of the "great books everyone should read" lists. It also used to be an entry on the "great books Jenni hasn't read yet" list. 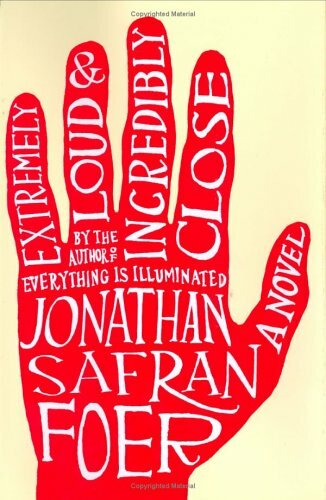 A friend of mine decided to start reading through this list of great books, and her decision to read morphed into an online book group of sorts, so I was motivated to finish this book because others were also reading it with me. I was intrigued to follow the story of Okonkwo, his family, and his tribe as Okonkwo first establishes himself as a man very unlike his father, then faces exile from his community, then returns to discover that missionaries have brought division to his once unified tribe. Truly things did fall apart for him. I found it interesting that the tribe tolerated and even enjoyed the presence of the first missionary, a man who was more moderate in his views and more willing to accept the cultural differences between himself and the African people, but that the divisions, difficulties, and violence happened when the missionary was replaced by a more zealous and less tolerant person. This book is definitely outside my usual genre of literature, but it was an interesting read and I am glad to be able to put it on my "books I have already read" list. 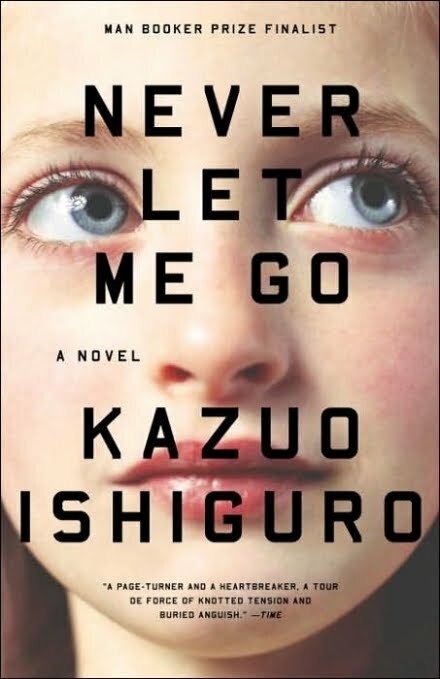 Ishiguro, Kazuo. Never Let Me Go. New York: Random House, 2005. This world you have just imagined is the one described in Ishiguro's Never Let Me Go. This novel chronicles the life of Kathy, a clone who has become a carer, a person who cares for other clones after their donation surgeries. She will be a carer until she is assigned a donation, and then she will donate until she "completes." Several of her classmates have already donated, and some have even completed. Kathy describes the world of the boarding school where she grew up and shares memories of herself and two of her closest friends as she reminisces about days gone by. This story is mildly interesting. The cloning idea intrigued me, but there was little in the way of a plot in this story, and the temporal jumps from memory to memory became awkward. Apparently there is now a movie of this book as well. I would recommend checking this book out of the library if you're interested, but it's probably not a good one to add to your bookshelves at home. Landis, Jill Marie. Heart of Lies. Grand Rapids: Zondervan, 2011. Have you ever watched an episode of What Not to Wear and thought, "Wow, that outfit is kind of nice, but it's definitely not for me"? That's the best possible way I can describe this book. In signing up for books to review, I must have mis-clicked or something. 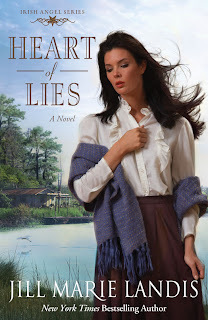 Heart of Lies is a novel in the Christian romance genre and has far too many love scenes and far too few aliens for my taste. Blech. This story takes place in Louisiana's bayou. A detective is trying to locate a woman's sister and also is looking for a missing child. These two cases lead him to the bayou and to the history of a Fagan-esque man who once led a troupe of child thieves in the streets of New Orleans. Once he [inevitably] falls in love with Maddie, the sister he was searching for, he has to decide, in the words of Dumbledore, "between what is right and what is easy." Should he give her up to the police or should they ride off into the sunset together? If you enjoy romantic stories with a Christian worldview, or if you're looking for a good beach read, this book is probably for you. Stop by your library to check it out, or comment on this post and I'll send you my copy. My sci-fi books keep chucking it off the shelf in the middle of the night. Casselman, Bill. 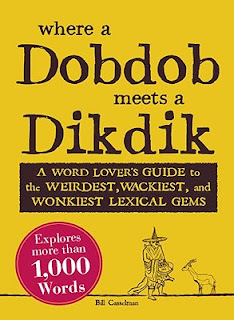 Where a Dobdob Meets a Dikdik: A World Lover's Guide to the Weirdest, Wackiest, and Wonkiest Lexical Gems. Avon, MA: Adams Media, 2010. I admit it: I'm a word nerd. I love words: weird words, long words, obscure words, funny words. This book is right up my alley. With chapters like "Nautical Words," "Creepy Words," and "Edible Words," I have enjoyed every page of this book. And the author has quite a way with words, so I have found myself rereading many sentences in this book and slowing my progress through it. My current favorite sentence is found in a discussion of dog hybrid breed names: "What a revolting concatenation of cutesiness and smarmy nomenclatorial treacle parading under the name of canine hybrid breed names" (19). I'm sure I'll have another favorite sentence in a day or two. This book is just that good and just that entertaining. Eggers, Dave. 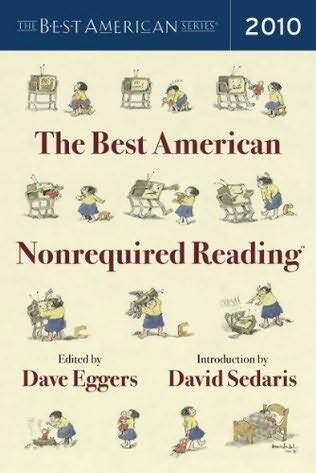 The Best American Nonrequired Reading. New York: Houghton Mifflin, 2010. This book is an anthology of works of literature from 2009 that did not win any significant awards but still merit consideration. In addition to more than a few short stories, there are also contributions from fast-food crimes, gun magazine headlines, lawsuits, brand names, and sentences on page 50 form published works, among other things. This book is a fun conglomeration and a great addition to a library, as many of the sections are fairly short and do not need to be read in any particular order. Hallinan, Joseph. Why We Make Mistakes. New York: Broadway Books, 2009. This book is a fascinating dive into the world of the human brain. 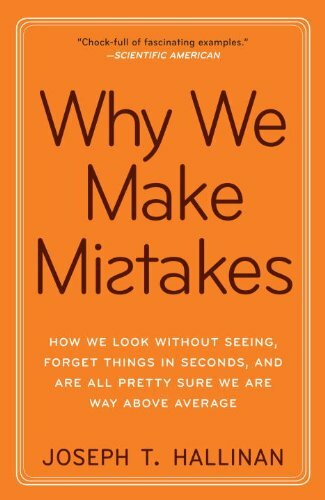 Hallinan discusses how little we see of what is in front of us, how quickly we can forget details, and how we often believe that we are better than the average person. He critiques the concept of multi-tasking and the differences between men and women all while providing a plethora of interesting illustrations and examples. This book was an excellent airplane read. It was enjoyable, easily digestible, and fairly non-controversial. 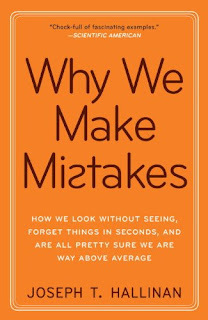 It also meshes well with Gladwell's Outliers, which I read a few months ago. This is a great "check it out of the library" book. Foer, Jonathan. Extremely Loud and Incredibly Close. New York: Houghton Mifflin, 2005. Nine-year old Oskar is grieving the loss of his father, one of the victims of the 9-11 attacks on the World Trade Center. When Oskar stumbles upon an old vase in his father's closet, he finds a key and a clue that leads him on adventures throughout the city as he searches for meaning and healing. This book is filled with many "normal" pages of text, but in similar fashion to The Invention of Hugo Cabret, there are several sections of pages with illustrations or very few words on the page. This aspect of the book is intriguing. I enjoyed this story. Watching the grief process from the view of a nine-year old was quite interesting. His adventures throughout New York were also intriguing, as it seems Oskar learned more from these adventures than he would have if he had been in school the entire time. However, there are more than a handful of objectionable scenes in this book, so I cannot whole-heartedly recommend this book. Frost, Randy and Gail Steketee. 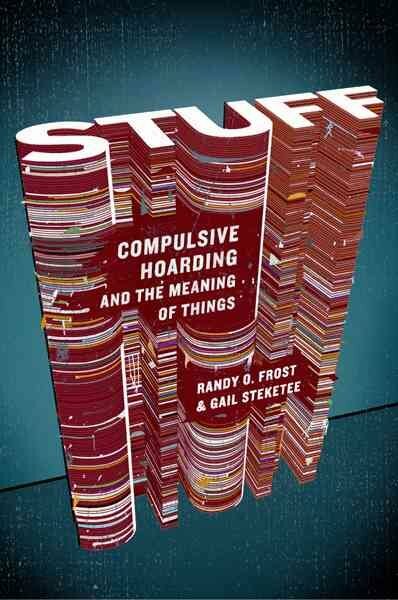 Stuff: Compulsive Hoarding and the Meaning of Things. New York: Houghton-Mifflin, 2010. I will admit that I have watched partial episodes of the TV show Hoarders. I'm not sure quite what it is about hoarding that fascinates me so, but it is interesting to learn about people who feel compelled to save every newspaper or piece of junk mail or who compulsively purchase clothing or other items until their homes are a maze of tiny trails through tons of trash. I guess I've always wondered what makes these people collect like that and why it is so difficult for them to stop or to allow anyone to help them clean out and organize their stuff. 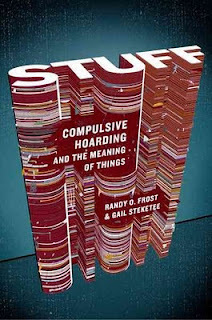 Frost and Steketee paint a clear picture of hoarding and delve into the minds of hoarders, all without shaming the hoarders, poking fun at them, or making them seem subnormal. Hoarding is a serious problem for many more people than any of us has probably considered, and many hoarders truly do need professional assistance to rid themselves of the hoarding habit. I found thing book to be enlightening and entertaining, as well as a good motivator for cleaning out my own stuff. McKinstry, Carolyn Maull. While the World Watched: A Birmingham Bombing Survivor Comes of Age During the Civil Rights Movement. Carol Stream, IL: Tyndale House Publishers, 2011. I was quite intrigued by this book. As an English teacher, I used to teach Mildred Taylor's book Roll of Thunder, Hear My Cry to my seventh grade students. It took the better part of a week to orient them to the context and setting of that story. During that orientation time, I brought in as many outside sources as possible. My students needed to understand the dark and frightening world that was the South after the Civil War. They had not grown up with this sort of racism or violence. In a way, I was glad that I had to teach them these things. If I still had a classroom, I would definitely incorporate this memoir into my lessons. 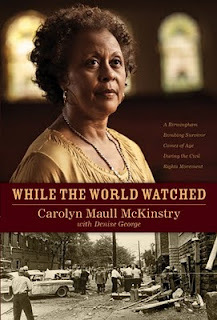 McKinstry does an excellent job of making the world seem real as she describes her childhood during the time of the civil rights movement. It was fascinating to read about this part of history from a first-person perspective instead of from a few paragraphs in a history book. McKinstry's faith also plays a bit role in her story, and it would be great to show my students what it means to live a life of faith in the midst of difficulties. This book is definitely worth reading, and for those in education, this is worth putting on your classroom shelf. Whitmire, Richard. 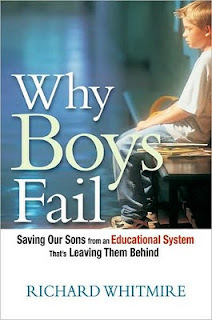 Why Boys Fail: Saving Them from an Educational System that's Leaving Them Behind. New York: AMACOM, 2010. School has become more complicated than it used to be. High-stakes testing and the No Child Left Behind Act have led schools to introduce more tests and more class time spent preparing for tests. In order to get kids ready for all these tests, kindergarten has become K4, then K3, and in some places there are even K2 programs. 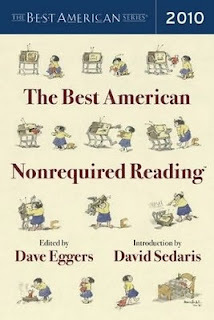 And they seem to be necessary; how else will a child be ready to read in first grade? And yet with all this testing and accountability, with the plethora of programs, we still see kids failing. And the majority of them are boys. Whitmire posits that this is due to an increasingly verbal classroom. Even math class, historically a haven for boys, has focused more on word problems and less on calculations. Add to this the plethora of young adult novels with female protagonists or softer themes and you have a recipe for failure. Many, many boys are failing, regardless of race, regardless of socioeconomic status. Whitmire suggests that we look again at the way we run our classrooms and that we make the necessary changes so that boys can learn in the way they learn best. Boys need the critical literacy and writing skills that they are missing when they "tune out" a lesson that seems boring to them. And it's our job to ensure that they receive these skills. I found this book to be a fascinating read. Many of the things I did in my classroom echoed what Whitmire suggested, but he had more suggestions that I would have wanted to try. Because he's right. By fifth grade, many boys are turned off to reading and to school and would rather be outside with a soccer ball or at home with a game controller. If you are an educator or a parent, this book is a must-read. Castleforte, Brian. Papertoy Monsters: 50 Cool Papertoys You Can Make Yourself. New York: Workman Publishing, 2010. I found this book at one of my favorite bookstores in San Francisco, and I carried around in the store with me for the better part of an hour while I contemplated purchasing it. 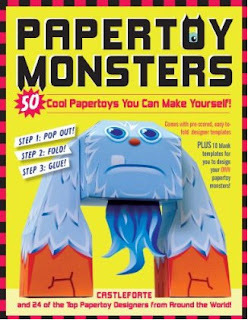 The book contains fifty different paper monsters, each ready to be created with the addition of glue and a little bit of time. The monsters are pre-printed on the paper and perforated, and there are directions for each monster's folding and gluing. I have only made one of the monsters so far, but I found the directions to be clear and easy to follow. This is a great gift idea for the kid or kid-at-heart in your life. Pierce, Tamara. 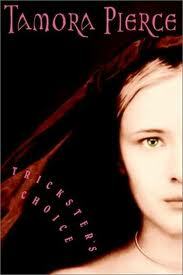 Trickster's Choice. New York: Random House, 2003. Aly is the daughter of the famed Lady Knight, but rather than practicing to be a lady herself, Aly wants to be a spy. She sneaks away from home one night in an attempt to prove to her parents that she will be safe on her own, but she is captured by pirates and sold as a slave. Enter the trickster god, who promises Aly her freedom if she can keep the children of the family she serves alive for one year. Aly accepts this challenge, but it is proving more difficult than expected to keep it. I have read several of Tamara Pierce's stories of the Lady Knight and her adventures, but this was the first time I'd encountered a book about the second generation. Unlike many sequels, this book is worth the time spent reading. It was a great "vacation day" read for me.